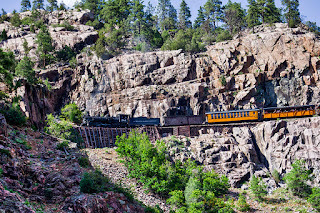 My image today goes back to the Durango & Silverton Railway once again. I took this image the day I was down in the canyon by the Las Animas River trying to get photos in the style of William Henry Jackson. This is the locomotive that I rode behind the next day as it made it's way along the Hi Line. At this point it is only moving along at 5 miles per hour due to the steep drop off. This image shows the red granite in the hills here very well on the left.